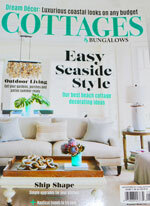 Recently I received a number of e-mails and comments asking me to blog about easy stenciling and painting projects. Since I am not very good at stenciling I asked my sister, Leslie, if she would give us a simple lesson in stenciling. Leslie, lives in Florida and is a flea-market and fabulous finds extraordinaire and is also an artist. 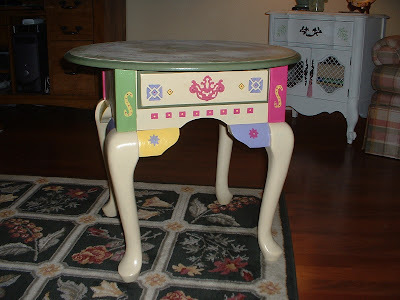 She paints on furniture in a whimsical style similar to Victoria MacKenzie- Child. We are both inspired by the simple beauty of God's creations and the colors of Mother Nature - especially the colors of flowers. As children growing up in North Carolina we spent hours in the Cottage Style playhouse our father built for us -my time was spent picking flowers to arrange on the table in our playhouse and Leslie spent hours re purposing the furniture and turning our playhouse into a "cafeteria" where we served blueberry mud pies made from berries and roast beef made from tree bark. I suppose it was only natural that Leslie would end up painting her flowers on re purposed furniture and I would end up painting my flowers on canvas. 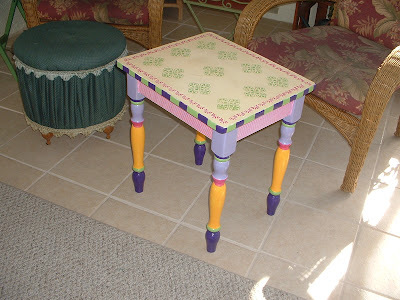 It didn't hurt that our creative Mother loved "re purposing" our bedroom furniture by painting it a different color every summer and painting flowers, birds and butterfly's on our furniture. She even painted sea shells and tropical fish inside our bathroom cupboard one summer. 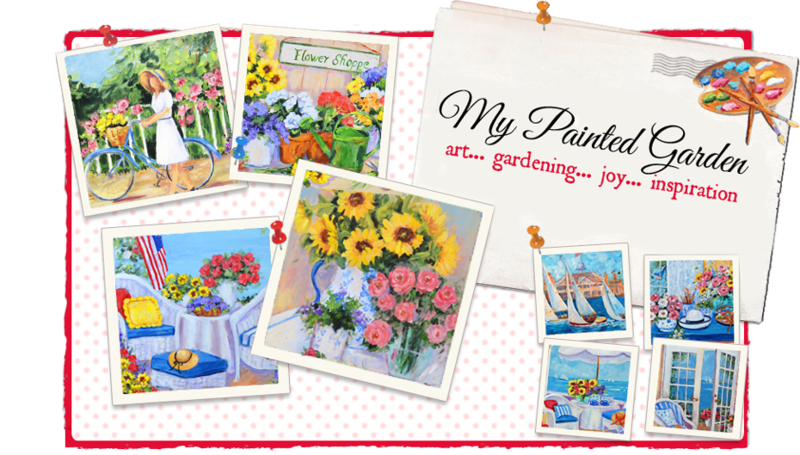 Let's leave my garden and take a little tour of the inspirations behind Leslie's painted furniture and afterwards she will give us a beginning lesson in furniture painting and stenciling furniture. 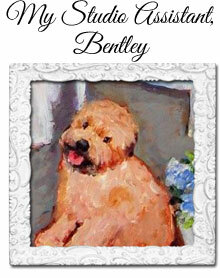 Bentley, my studio assistant, waiting to leave our garden to look for Leslie's inspiraiton. Leslie finds a wonderful palette for her furniture by using her favorite colors of flowers and leaves - pink, fuchsia, yellow, soft gold lavender and apple green. The old round table was a gift from Leslie's daughter-in-law. The table had been in her family and she wanted Leslie to bring new life to the table by drenching it with the soft colors in Leslie's palette. 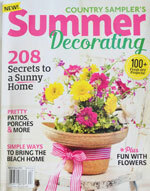 She stenciled a floral design on the top. Let's get started. 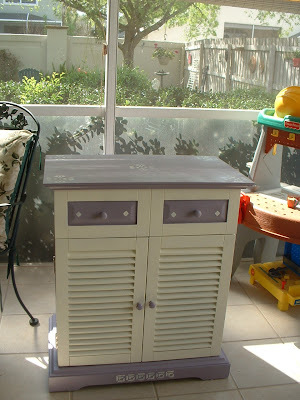 Leslie is going to paint and stencil a $10.00 chest she purchased at a garage sale. 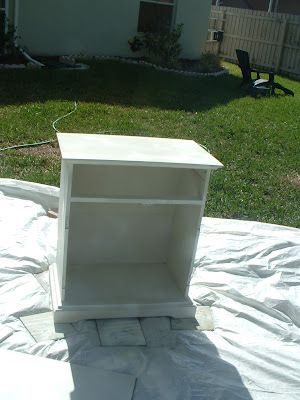 The first step in painting furniture is to remove hardware, drawers, doors etc. Lightly sand and wipe down with a clean cloth -next base coat with a good quality primer - such as Kilz or Zinzer 1-2-3. If you want to add appliques do so at this time. 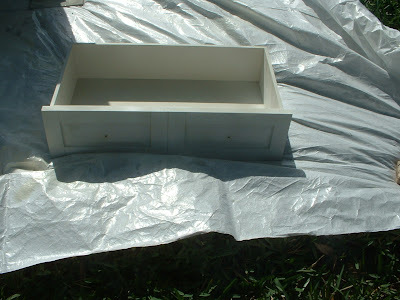 After priming -paint with paint of your choice - she used an off white enamel for the drawer and accents (left over paint trim from her house) and also uses latex indoor house paint. 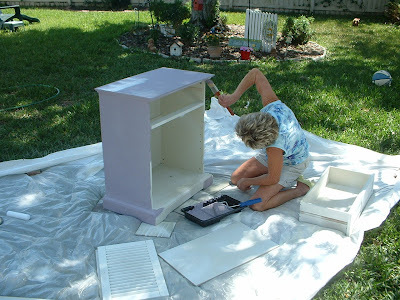 Then she painted the rest of the chest with lavender latex paint. Now for the fun part - the stenciling. The side and was stenciled with a stencil that came as three different patterns all on the same stencil. Tape the entire stencil with painters tape. TIPS - always tape the stencil down - this will prevent running and keep your design neat - apply a very small amount of paint to your brush and lightly dab the brush over the stencil. Too much paint on the brush causes blotchy designs. Remember - stenciling is a "dry brush" technique. 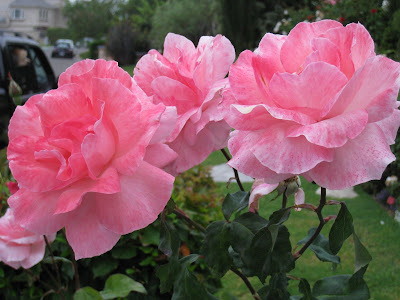 It is best to build up your color gradually. Hold the stencil down as you brush to prevent paint from getting under stencil. Take the stencil off as soon as you finish painting. Joannes and Michael's sell stencils like this by Plaid and they are easy to use because they are big. 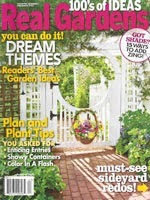 For corners, you can cut a large stencil with three patterns, and use one of the patterns on the corner and the other patterns on top and in the middle. 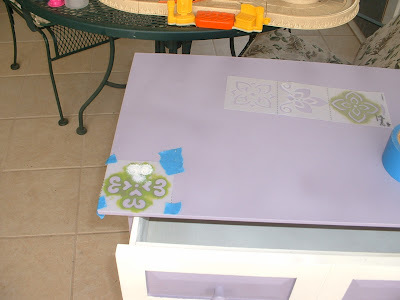 This way you can have three different patterns from one stencil and you can stencil the corner with ease as you will have a smaller stencil to work with. The diamond pattern on the drawer was made by using a small stencil with a diamond pattern - if the stencil is too big simply cut around the diamond and make a smaller stencil. The last step is to seal the entire project with a sealer to make sure the paint does not rub off. I think it is time for me to pass the "Fabulous Finds" Award on to Leslie. She believes that flawed is fabulous and it is a lot more fun to turn someone else's timeworn furniture into something beautiful than to buy something new and perfect. 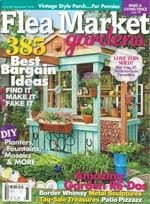 You can read more about the "Fabulous Finds Award on one of my previous blog post. If you want to stencil on a canvas to create your own canvas work of art follow the same basic directions for stenciling on furniture. First base coat your canvas. Then tape the stencil to your canvas and apply paint in a dabbing motion. Immediately remove the stencil. Thank you so much for the great information. I know that I can create something beautiful with your helpful tips. I am of to buy my first stencil. Fabulous post Erin...I love to stencil. 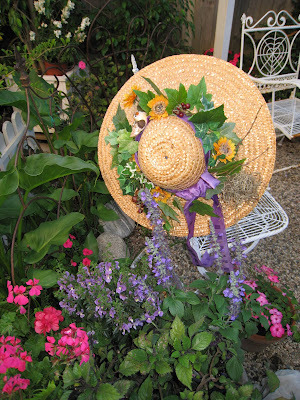 Your sister Leslie is wonderful and so creative...Loved her beautiful projects. Thank you - thank you - your blog is so beautiful and you and your sister are so nice to take the time to share with us the how to projects. I feel like I can create something wonderful myself. I think I have the same stencil as the one on the edges of he round table-- the green leafy one.--I still have part of that stenciled on a section of one of my fireplaces. 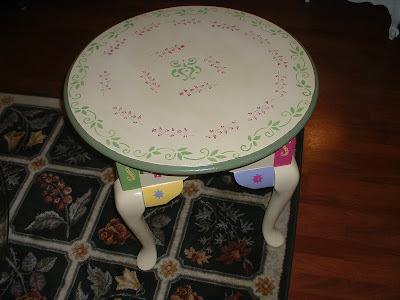 I used to have it stenciled on a wall over a window , but no longer .....--I like how refreshing she made some of the tables look. Hi Erin. This is my first visit to your blog. 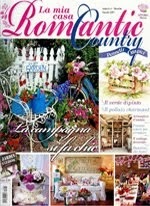 I discovered your blog from Lavender Dreamer blog. 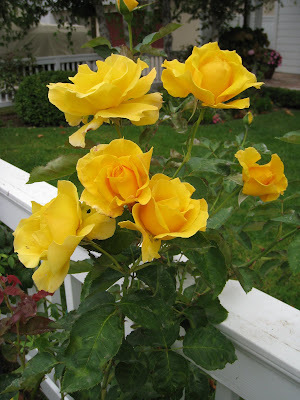 I live in North Carolina and love to grow roses! I'm a professor by day and write mysteries and make jewelry by night. 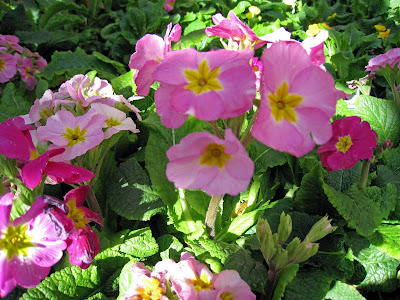 Come visit me at my blog at www.thehousemysteries.typepad.com. Love your work! I just LOVE coming to your blog! Everything is always so gorgeous and inspiring!! I love the tables you did, fabulous job sweetie!! and that picture of the Gate and your puppy?? Right out of a magazine beautiful!!! what a fabulous side yard you have! and all your flowers and crafts and pictures make me so Happy!! Thank you for showing such wonderful ideas and visuals, you are one super talented lady!! You all are amazing - so talented and creative. I thank you from the bottom of my heart for the lesson on how to stencil. I feel like I can create a "mini work of art" on my furniture and canvas. 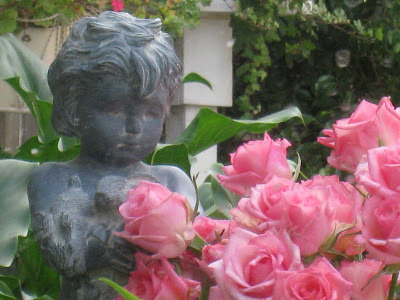 Love to tour in the garden,makes my day compete and more alive.Hope you will continue to take care of your garden.